If you fish from a small boat that lacks battery compartments, it is a very smart decision to invest in battery boxes. Marine battery boxes provide secure mounting of one of the heaviest items in the boat and make them easier to carry if you need to be portable. They also protect your power sources from water and corrosion. 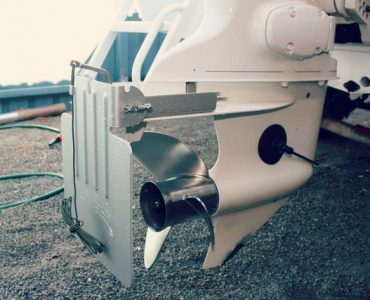 Imagine a rogue wave coming over your gunnel and shorting out your trolling motor battery, leaving you stranded. With a waterproof marine battery box, your trolling and cranking batteries are protected from rough water. Not only do they add convenience and safety to your boat, but they can be highly functional as well. Today’s boat battery boxes are much more than a plastic shell. 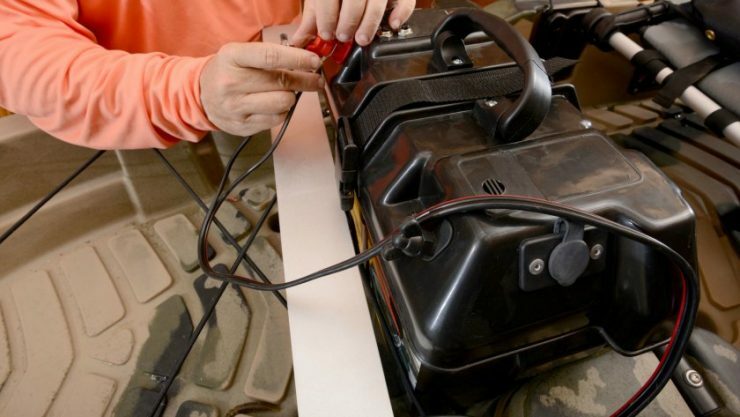 In this guide, we will dive into the new features of the best marine battery boxes, and why anglers will find them helpful. Minn Kota Trolling Power Center – Perfect battery box for small trolling motors, plus battery meter and 12V accessory power. Yak-Power Power Pack – An all in one battery box best for kayak fishing. Waterproof cable ports, with external USB charging. Newport Vessels Smart Battery Box – The best smart battery box with all the features. UPG Marine Smart Box – The best cheap smart battery box. Attwood Battery Box – The best cheap, basic 12V marine battery box. Even though we are only talking about a plastic box to cover a battery, there are still important factors to consider when choosing one. Each box is different and comes with various features and capabilities that anglers may or may not need. 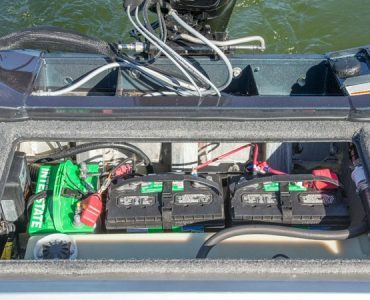 When looking at battery boxes, it is important to look at the box and think about how this would work for you on your specific boat. It has to make sense for you and your situation, so consider all of the following before making a decision. Secure Mounting: Marine batteries are heavy. The last thing you want to happen is for a 50lb battery to slide around in the boat, tip over, or worse fall into the water. Make sure that the box you buy has secure mounting provisions with clear instructions on how to do it. Be sure to confirm the size of the box is going to work and be functional in your boat. Waterproof: A waterproof box is not something to opt out. When it comes to choosing between a waterproof box and a non-waterproof one, the first box is going to provide you with a lot more peace of mind knowing that your battery is safe. Exposure to water can cause arcing, and excessive moisture causes corrosion and lessens the life of your battery. Easy Terminal Access: While it is essential that the box protects your terminals from the elements, you want to make sure the box offers you quick and easy access in case you need to get at them in a hurry. It’s also nice to be able to easily access the terminals when connecting a battery charger, instead of having to struggle. 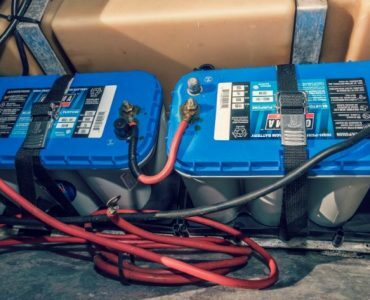 Easily Portable: Marine batteries can weigh in excess of 50 pounds, so if you do not store your boat battery on board, you will want your box to serve as a carrying case. A box with nice big handles that allows you to transport the battery when necessary easily is your best option. It seems like everything is getting “smart” and more technological these days and this even extends to the battery box on your boat. With advancements in the way we store our batteries, we can get a lot of great features that make your life easier out on the water. Battery Meter: A marine smart box battery case has an LED display that shows you your battery levels in real time. This feature takes any guessing out of the equation and allows you to quickly and easily read your battery without having to connect or disconnect anything. The indicators are easy to read regardless of the level of sunlight and are resistant to harsh weather. Battery Health Monitor: Many smart battery boxes come with a battery health monitor that gives you constant updates about the usability of your battery. If you are extending the life of your battery by using the proper amperage or if you are shortening its life by overexerting it, the battery box is going to tell you that in real time. USB Ports: The smart battery boxes come with easy to access USB ports to charge your devices from the batteries supply. This feature is great for extended trips or in emergency situations. You won’t ever have to get stuck out on the water with a dead phone or camera. Here we are covering the best marine battery boxes for a variety of applications, from kayaks to small fishing boats and pontoons. Why we Like it: Best all-in-one battery box solution for small boats. Good features like accessory power and breakers. The Minn Kota is a marine battery box power station with easy to access terminals for connecting and disconnecting 12-volt trolling motors, and incorporates accessory plugs, breakers for safety, and a battery charge level display. This box is designed for Group 24 and 27 sized batteries and fits these batteries snug to reduce vibration and shock to the battery. This box is ideal for smaller boats running a 12V trolling motor that does not have a specified battery compartment. The accessory ports work well for things like fish finders, cameras, and other devices. The power center is sturdy and is designed to hold up well in adverse weather conditions. 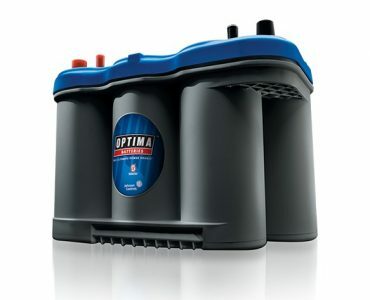 Overall this the best marine battery box for the money and earns our top recommendation. This battery box is great for kayaks and meant to hold three 7ah batteries or two 12ah batteries. The box comes with an adjustable track and internal straps to secure the batteries in place inside the box. The Yak-Power box comes with USB charging capabilities, so you can draw from the batteries power to charge your devices. This battery box is waterproof and comes with a durable handle to transport your batteries. This box is designed with a master switch which is intended to work each component of the power pack. The manufacturer does not recommend trying to splice any wires to utilize one feature at a time. The box is meant to be all or nothing. Reviews for the Yak-Power box show that it is one of the best battery boxes for kayak fishing. The USB ports work great, and everything is pre-wired so it’s perfect for running a bunch of devices at one time. The main critical review for this device states that even though everything is pre-wired and included in the box, the wires are too short and very basic. This marine smart box battery case comes with a variety of excellent features. This box comes with a built-in battery charge meter, external ports for you to connect your motor or other accessories to without having to open the box or disconnect anything. The Newport Vessels Smart Battery Box also comes with two circuit breakers with 10 and 60 amps to protect you from electrical issues. The battery box is simple to mount and comes with a non-slip rubber design to ensure that the box does not slide around. On the exterior of this smart battery box are a USB charger and 12v accessory port for your convenience. This box is perfect for inflatable and smaller boats. The box itself is sturdy and holds the battery nicely in place. One critical review I read on this battery box states that the instructions that come with the box are somewhat misleading. The battery has to be under a load of a running motor, and then you hold the button down to get an accurate reading of the current battery charge. Be careful of this if you purchase the battery box. This smart battery box is made of durable polypropylene to prevent acid leakage and comes with a sturdy strap and two auxiliary ports on the exterior of the box. The UPG marine smart box also comes with mounting hardware and fits battery sizes 24 and 27. One drawback with this box is that it does not come with any handle for transporting the battery. Aside from that issue, the charge meter and external ports on this battery box are very useful. Reviewers also say that the box is designed to be sturdy and the batteries fit nicely into the box without too much vibration and movement. This is the basic/standard battery box. All of Attwood’s battery boxes meet ABYC standards and U.S Coast Guard specifications. The box comes with a strap that holds down up to 350 pounds of force which is four times the requirement, so your battery should not be forced out of this box no matter what happens. The Attwood box is made of polypropylene, which is highly acid resistant and tested successfully in temperatures from -20F – 120F. This box comes with hardware to mount to your boat, large and sturdy handles, and ventilation holes. They have three sizes of boxes, the Power Guard 24, Power Guard 27, and Power Guard 31. The number corresponds to the group size that fits in the box. The 24 and 27 both have 4 cable openings, whil the 31 has eight and is geared more towards larger uses. Reviews for this box say that it serves its purpose well and for the price is a solid and well-constructed battery box. The only critical finding on this box is that the strap does not always stay tight, it needs to get checked and tightened somewhat frequently while on the water. This smart power station comes with a ton of features such as a built-in battery tester, power sockets, steel nuts, circuit breaker, and battery condition monitor. This company claims to have the number one power station battery box in the business. The box is built for all conditions and has external terminals for easy access. Reviews on this box are good; most people state that the box performs as expected and is a smart purchase. The only critical thing said about this battery box is that you cannot carry the box from the handle when there is a battery inside without breaking the handle. This battery box is a rugged and sturdy, if plainly constructed box, built for battery in groups 24-31. The box has a specially patented locking system that fastens the lid to the base securely and guarantees against leaking or excessive vibration. It also comes with easy to use handles on the sides for transporting the battery from place to place. The NOCO Snap-Top box has been tested to negative twenty degrees and is proven unaffected by acid, gas, oil, and UV rays. NOCO’s box design ensures the battery does not move and protects against shortages or acid spills. The box is built with plenty of ventilation as well. This battery box holds certification by the United States Coast Guard Regulations and the American Boat and Yacht Council. Most owners are generally positive on this box, comparing it favorably to boxes that are more expensive. It provides everything you need including durability and functionality at a great price. The only critical thing said about this is that the battery dimensions on the box do not always line up with the battery itself, so make sure your battery is going to fit before purchasing this box. When choosing the right battery box for yourself, it’s important to consider exactly what you need to get the job done. For some anglers, a smart battery box with all the bells and whistles may not be necessary. The Minn Kota Trolling Power Center is an ideal solution for small boat trolling motor systems. Whereas the Yak-Power Power Pack is an advanced battery box just for Kayak fishing. If you are into the features of a smart battery box, the Newport Vessels Smart Battery Box is an excellent choice with all the extra features that you want. In the end, only you know what the right choice is for you!